Memphis, Tn — Frankie Montas delivered a complete game, but the Nashville Sounds fell to the Memphis Redbirds, 2-1, Monday afternoon at AutoZone Park. Montas used only 93 pitches to breeze through eight innings. The right-hander yielded a pair of solo home runs to Redbirds’ right field Tyler O’Neill. The solo blasts were enough as Nashville squandered two golden opportunities in the middle innings. O’Neill hit a solo home run in the second, but Nashville’s Anthony Garcia answered with a solo blast in the top of the fourth to even the game at 1-1. The tie didn’t last long as O’Neill launched his second homer of the day in the bottom of the fourth to give Memphis a 2-1 lead. With the bases loaded and two outs in the top of the fifth, Slade Heathcott broke for home after a pitch briefly got away from Redbirds’ catcher Jeremy Martinez. The backstop recovered, and Heathcott was tagged out in a rundown to end the inning. The top of the sixth started with Memphis right-hander Dakota Hudson issuing three consecutive walks. The Redbirds turned to reliever Edward Mujica to get out of the jam and he did so by striking out Sheldon Neuse and Heathcott, then getting Steve Lombardozzi on a fly out to center. Aside from an infield single by Nick Martini in the seventh, the Sounds didn’t get any offense going the rest of the game. Montas threw 60 of his 93 pitches for strikes as he matched a career-high eight innings. He has three consecutive starts of at least six innings while dropping his ERA from 6.19 to 3.75. The Sounds and Redbirds conclude their four-game series Tuesday morning in Memphis. Right-hander Daniel Gossett (3-0, 1.93) starts for the Sounds against left-hander Austin Gomber (2-2, 4.25) for the Redbirds. First pitch is scheduled for 11:05am. With today’s 2-1 loss, the Sounds dropped to 19-18 on the season. Nick Martini extended his consecutive on-base streak to 25 games when he singled in the fifth inning. Since April 14, Martini has reached safely in every game he has played in. Frankie Montas matched a career-high with 8.0 innings. It’s the longest start by a Sounds pitcher this season. 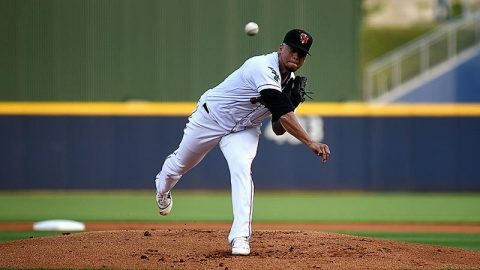 Montas joins pitcher James Naile as the only Sounds pitchers to throw a complete game this season. It’s the fourth complete game of his career, and first since June 9, 2015 while pitching with Double-A Birmingham.